Made from reclaimed steel scraps, these stakes bring their playful poses to your outdoor decor. Ever wish for a group of green-thumb fairies to help with the gardening? Made from reclaimed steel scraps, these stakes bring their playful poses to your outdoor decor. 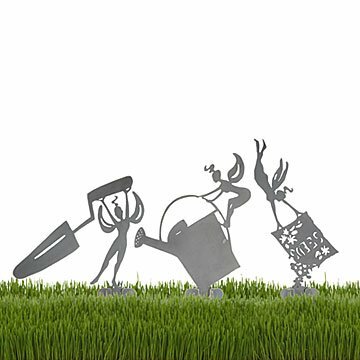 Each silhouetted fairy carries a watering can, spade, or seed packet in her active pursuit of a magical gardenscape. They feature laser-cut edges for a subtly weathered effect and a protective clear coat finish for year-round outdoor use. Sold individually. Designed by Sandi Bruns. Made in Omaha, Nebraska. Sandi Ericzon Bruns was born in Elmhurst, Illinois in 1942 with a crayon in her hand, and has been making art ever since. In High school she won several Scholastic Gold Key awards and was awarded the prestigious Allerton Park Art Scholarship. She attended University of Iowa on an I-Club Scholarship for art, majoring in Related Arts, Design and Textiles. At University of Hawaii she got her BFA equivalent and an MFA in Art/Printmaking. She has worked in the Graphics Departments of both University of Iowa and University of Hawaii, and still does commission work (tiny and larger) under the auspices of her one-woman company. In collaboration with co-author Anne Fenner she wrote and illustrated “Dress Smart,” now in its second edition. She currently shows her art work in Colorado at The Arts Alive Gallery in Breckenridge and had two paintings chosen for the Siverthorne Art Wall in their developing Arts District. Due to material availability, stakes may include a combination of virgin and scrap steel, with no less than 20% scrap. This is a nice size and so different. What's fun is that you might not see it right away so spotting it nestled among the flowers feels like a secret surprise. I've only had it for several weeks but I can tell it's durable enough to last for a long time. I'll be purchasing the other two. This was a great garden decor gift for my mom, who LOVES to garden. Very cute. I got this product for my aunt who is a super fun and quirky artist. She has everything and doesn't need anything. This was perfect because she has fun sculptures in her whole yard but nothing in her garden. The fairies add a fun, whimsical feel to the garden and remind you to not take life so seriously. Great gift! We thought the product was very well made and being made from recycled materials was an extra bonus. Such a unique item for her garden I had to get one. Tough decision on which design to buy. great gift, I will purchase the other two in this group. Fairies are always whimsical, mysterious and attention catching, the Gardner Fairy Watering sculpture fits the bill on all 3 counts! I would definitely buy this item again! My sister put it in the sand in the front of her house. Very easy, looks cute and her grandchildren love it!